CHICKENS There are obvious advantages to keeping chickens. They lay about 5 eggs each per week and when they get older and no longer lay, they provide meat. One egg provides as much as 6 grams of protein! We have a chick en coop at the Children’s Home now. 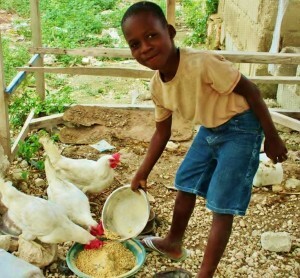 If the chickens can provide enough eggs for the household and there is a surplus, these eggs can be sold at the market and bring some self-sustaining power to the Children’s Home. We usually buy the chickens when they are a few months old and already starting to lay but will be buying some newly hatched chicks and also a rooster soon. We are now planning a community chicken coop for the village of Roche Campe in an effort to combat the malnutrition there. If you would like to buy a chicken for $10 and provide up to 260 eggs per year please donate via PayPal. GOATS Gifting goats for milk and breeding is a simple way of increasing the income and stability of a family. With little employment on the island many families cannot afford the fees or uniform s required to send their children to school. Goats have two or three kids at at time so the family will keep one or two, sell one and when they have several they will gift one to another family in need. We are starting this project NOW! Three families will be the first recipients and along with their goats they will get some education on how to take care of them. We have been fortunate enough to receive donations that have allowed us to gift a few more goats now. The slow but steady improvement owning goats can make to a family is awesome – children can have more and better food, attend school and the family has some income security. When we gift a goat we get the goat immunized and checked over by a vet and also give the family a large sack of goat food and some goat-care advice to get them started. 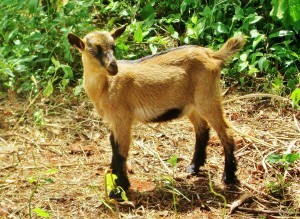 If you would like to help a family and gift a goat for $75 please donate via PayPal.